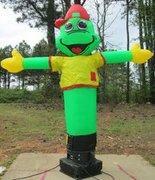 Advertising inflatables are a great way to be noticed. Let your customers or event guests know where they should be with these giant "Sky Dancers" who demand attention, and can draw the eye of potential customers or visitors into your location. Here you'll find other great promotional tools as well. Browse the items below and click on the title or image for more information and to make a reservation.